Let’s say disaster strikes your website. You could get in touch with your hosting company if your plan includes regular backups. But it might not be enough. Your site goes down because a bad or incompatible plugin or theme broke it when you made the latest update. Your site goes offline and you lose access because a hacker installed ransomware on it and is now demanding payment. Your site goes down because your client was doing something they shouldn’t have done and you forgot to protect it from them. There is any number of reasons your site could end up lost, damaged, or stolen, and it’s up to you to restore it as quickly as possible. By owning the process of backing up your site, you can set things right a lot quicker than if you rely on the WordPress community to lend their advice or wait for your hosting company to help. This is not one of those things where you have time to spare. WordPress outlines a number of ways in which you can backup your site in its Codex. Today, however, we’re going to focus on how to automate this process by using, of course, WordPress plugins. Whether it’s a security breach, user error, or something else entirely, a downed website is no good. So, your best bet in keeping your site safe is to always be ready to recover from that potential disaster with a backup. By using a high-quality backup plugin, you can take control of how quickly and efficiently that happens. 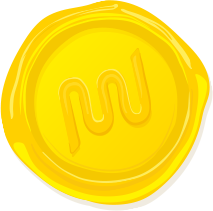 Before we dive in, a quick plug for WPMU DEV’s cloud backups. Every member gets 10GB of free cloud storage, which you can use to backup your websites. WPMU DEV members get 10BG of cloud backups. And if you have a lot of websites and need more storage, just click “Add Storage” to upgrade to one of our paid backup plans. Why do we offer backups for members? Because having website backups is a no-brainer, really – you should always be ready for the unexpected, whether you need to recover quickly after accidentally deleting a file, experience hardware failure or you get hacked. It’s recommended you keep at last three backups of each of your websites from the past three weeks. Currently, when members hit 100% of their 10GB quota, their oldest backups are routinely deleted to make room for new backups that are created. So if you are backing up multiple websites with large files, you can quickly run out of space and lose key backups if you don’t have enough storage. BackupBuddy is the premium WordPress backup plugin from iThemes. What you’re going to find here is a truly premium service and one that would be helpful if you have a large network of clients whose sites you want to securely back up. It takes only a handful of steps to back up, restore, or migrate your site. 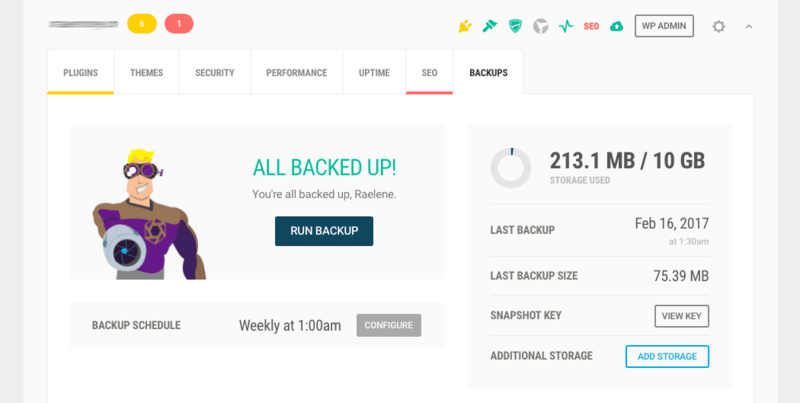 You can customize what exactly you want your backups to save (e.g. just your database or the full WordPress installation). You can also customize the frequency of backups, from hourly to monthly. You can save your backups in a variety of locations, including Amazon, Dropbox, or Google Drive. You can also just download a zipped folder of the files. Includes the ImportBuddy tool which helps you restore your site from the backup. There is a migration feature as well so you can safely move sites from different hosts, servers, or domains. For developer-specific plans, you can use this feature to safely move your staging or test sites. Bonus tools are available, like malware, database, and server scanners. This plugin costs money to use and the plan you’d likely need to cover all your clients’ sites is pretty costly. Although iThemes offers their own backup storage Stash Live for free, most plans only cover it for a year, which means you’ll have to start paying for it or make a switch down the road. BackUpWordPress is a simple backup solution. If that’s all you’re looking for (i.e. you don’t need restore or migration assistance), then this is a good plugin to look at. You can use the limited free version or you can upgrade to premium so you have more control over where your data is backed up. This is available for free as well as for a premium. Premium plans allow for different numbers of backed-up sites, so you have affordable options to consider as a developer. Going premium will also give you the ability to save your backup wherever you want: on your server, emailed as a zip, or to a file storage service. You can create different backup frequency schedules. There’s a robust knowledgebase available on their site in case you run into questions and want to troubleshoot on your own. Premium plans come with a year of priority support though. The biggest complaint customers have about the free plugin is that the backup can be slow or buggy. The developer attributes that to customers’ running backups when resources are low on their server, so be cautious of this. There are no restore or migration services available. Although there is a premium version of this plugin available, I’d suggest you first start with the free one as it seems to do a bang-up job in backing up WordPress sites. The main difference between the two is in the type of support and updates you receive as well as the number of sites covered. Saves your total WordPress installation. Can push backups to your directory, FTP, or third-party storage service. Database optimization, scanning, and repair feature included. If you’re willing to pay for the premium service, you’ll receive priority support as well as automated updates. Appears to be well-supported as the developer quickly responds to each customer’s complaint left in the repository. The premium version seems a little too expensive for a strictly backup plugin. There are also some evident bugs here–some of which the developer is aware of and working to address. Here is another backup and restore plugin that comes with both a free and premium version. While the free version works great and is probably the highest rated plugin I’ve seen in the repository for backups, I’d recommend using the premium plugin for the advanced features it gives developers access to. The free plugin enables users to backup and restore. The surprisingly affordable premium plugin does backups, restorations, and migrations. Back up either specific files or the entire installation–and all it takes is one click. It’s a great option if you just want to set it and forget it. You can save your backups to most third-party services or just get it emailed directly to you. There are a few things that set the premium plan apart from the free and from the competition. There’s, of course, the migration tool. It also will automatically back up your site before any updates (core, plugin, or theme) occur. Finally, you can use it to retrieve backed-up versions of your site if you were using another plugin that doesn’t have restore capabilities. The UpdraftCentral plugin extends this one to make it Multisite-compatible. As a developer, you can also customize how this plugin works on your clients’ sites. That way, they don’t have to be bothered by backup alerts if you don’t want them to. While it’s great to see the developer respond to nearly every complaint logged in WordPress, you can tell they’re often very frustrated with their users and unable to just say “sorry, let us help”. VaultPress is Automattic’s contribution to the backup and restore game. Consequently, this means that the only way to access this plugin is by purchasing a premium Jetpack plugin. If you’re not a fan of Jetpack, then this one isn’t going to be for you. If you already have Jetpack premium, then there’s nothing more for you to do but activate your backups. You can also purchase this as an add-on to the free Jetpack. There are a couple of business plans available that include some type of automated backup service. They also come with one-click restore as well as site migration features. Security scanning is included, so you’ll also have the benefits of brute force attack prevention, spam protection, and uptime monitoring. Additional Jetpack features come with this, like video hosting and Google Analytics integration. This plugin won’t back up your full WordPress installation; only your dashboard and content files. This is only available as a paid service. It’s not too expensive, but it’s still unfortunate that there’s no free version available. You also can’t purchase this separately from Jetpack. So, if you happen to be opposed to the bloated nature of the JetPack plugin, there’s no way to separate VaultPress from it. This is a great free plugin to consider if you want something simple and easy for your clients to manage their own site backups. However, if you want to unlock the restore and migration features, you’ll need to go premium. This plugin backs up your entire dashboard or your entire installation–choose the files you prefer to save. It’s great for WordPress novices as it’s easy to use and the free version doesn’t force you to charge your clients extra to use. Unlimited backups are available for both the free and premium plans. The premium plugin gives you more control over automating and scheduling your backups. It also enables you to restore, migrate, and clone your WordPress site. If you’re going free, be careful about using this with large sites or Multisite. This plugin is not compatible with any third-party storage services, so the only place you can retrieve your backups from is the WordPress dashboard. Although they promise the files are compressed, that could compromise your site’s speed if not closely managed. Of course, for those of you who are WPMU DEV members, you’ll have access to Snapshot Pro for all your backup and restore needs. This plugin is not only fast, but it’s convenient and safe, too! It’s your choice what you want to back up: a specific set of files or your entire website. Backups are all automated and at a frequency you prefer, from daily to monthly. You can also ensure that they run before any plugin, theme, or the core is updated. You can also choose whether you want to back up one WordPress site or Multisite. This plugin enables you to do a quick, one-click restore, too. Site backups go to your FTP, Amazon S3, Google Drive, or Dropbox account. Or you can store them in the 10GB of secure cloud storage WPMU DEV gives you. You can also set limits on the numbers of backups saved to conserve space. Hmmm… Maybe that there isn’t a free version available yet? Interested in 7. Snapshot Pro? Every WordPress site needs a comprehensive security plan. And every security plan needs to include a reliable backup solution. 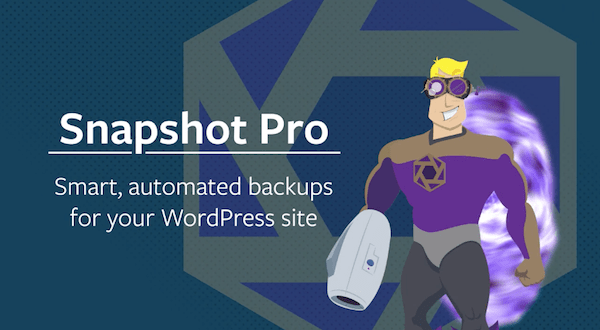 Today, I’ve given you 7 of the best backup plugins for WordPress. But which one is right for you? Well, most of these come with a free version that you can try out, though that’s not always an accurate reflection of what you’re really getting since they’re not supported and tend to only handle the backup part of the backup/restore formula you really need. UpdraftPlus is the plugin you absolutely need if you’re running a WordPress development business. It’s flexible, it’s affordable, and it covers all your bases. It also comes with developer-specific features so you can have more control over what happens with the backups once they’re in your clients’ hands. BackWPup is a great choice if you want something simple and free you can throw onto your smaller client websites. It’s easy to use and comes with some awesome support and response times from the developer in case you should run into issues. Snapshot Pro also gets my vote because of the built-in security of the plugin. If you think about it, storing your backups on your server won’t help you if your site goes down or you lose access to the database. And free or cheap third-party services aren’t always the most well-secured. With WPMU DEV’s contribution of 10GB of cloud-hosted storage, you can ensure that your backups remain out of harm’s way. Over to you: When was the last time you had to roll your site back to a previously saved version? What was the reason for it? Which of these ones offer incremental backups? Backup plugins have undergone major changes over the past couple of months as our storage needs have changed. Snapshot is one of the backup plugins that let you decide what you want to backup. You can do a full backup of your entire site or network or individual folders (include or exclude what you want). It gives you the choice of what to backup and when to back it up. WPTIMECAPTUAL lets you do incremental backups. Whenever I have one-off WP sites to back up, UpdraftPlus is my absolute go-to. I’ve been able to automate backups and restore without any trouble, and it saved my bacon when a client’s site was compromised. It connects to Dropbox with zero hassle, and Google Drive just takes a few extra steps. Considering all it does for free, I’ve never been inclined to purchase the premium version. Every client that I can roll into a full service maintenance-monitoring-backup-security plan gets the Snapshot treatment (along with Defender, Uptime, Automate, etc.). I’ve just upgraded the cloud storage and the service has paid for itself many times over. It’s almost painfully simple and reliable. Have you posted a feature request yet? There might be other members who are using the same servers and would like it as a feature too. The other thing that I would suggest is, to pop into our amazing live support chat. Our techs can take a look at what is happening behind the scene and see if they can’t get it to work. Sometimes it is just a setting that needs to be changed. Hope you find a solution for this soon. Thanks for reviewing UpdraftPlus! A couple of minor things. You say, “The UpdraftCentral plugin extends this one to make it Multisite-compatible.” This needs modifying… UpdraftPlus is fine with multisites already. What UpdraftCentral is is a separate product; a remote dashboard for management of multiple WordPress *installs*. i.e. In the same space as things like ManageWP. Concerning our attempts to respond in detail to issues raised in negative reviews, you have misread the motivation here; the point of detailed responses to specific compliants raised is so that potential users who research the negative reviews can be assured that we pay attention to any possible issues and don’t ignore any negative feedback and (if relevant) that there is a solution to the problem that the user had. I will have to see if we can try to make that clearer; I don’t claim we get it all right, but you have very much misread that. As I say, thanks again for the review. Oh nice, I will try that today. Thanks @Michelle ! We’re very happy with Wptimecapsule. It offers incremental backups, cloud storage, partial restore, white labeling, for few bucks/month and has a generous free version too! P.S. : if you’re not familiar with incremental backups, they are much lighter and less resource intensive then regular ones. Also easier to work with the backup files as there aren’t huge zip files to handle. Hi, I must say I really liked this article. First because you do not look bias about other plugins versus yours. I have always used Updraft free, and I am really happy with it. I have recently started trying yours which is also great and for my personal sites the space is more than enough. Unfortunately most of my clients do not understand the value of a backup outside the main server where they have the website. So they opt to use Updraft and store in the same server as the site. Not the end of a world because we can always ask the hosting service for the lastest backups.